First Sign up here and follow the instruction on the screen. Choose the free plan or go with a paid option if you need more. On the free plan you have a daily limit of 5.000 mails and 100.000 per month. * Update: SparkPost announce an update on their service plan on the 18th of August 2017. Read more here. SparkPost needs a domain you are sending from. You must have access to the DNS entries so SparkPost can verify that you are allowed to send from this domain. Choose a name like “Mailster API Key” to identify it later. Mailster can only work with a Master API Key as it requires Account read capabilities. Account: Read, Message Events: Read-only, Send via SMTP (for SMTP delivery), Sending Domains: Read, Subaccounts: Read, Transmission: Read/Write (for WEB API delivery). You can keep this field blank if you are not sure which IP you are sending from. You have to create a sending domain from the domains you own and were you are able to change DNS records. A a new TXT record to your domain. Ask your provider on how to do it. A change to the DNS entries can take up to 24 hours to propagate! You can also use email verifications which is normally quicker. You have to make sure your domain is “ready to send”. After you DNS setup has been SparkPost will review your domain. Head over to the WordPress repo and download the SparkPost Integration. Alternatively you can do this via your WordPress’s plugin site too. After enabling you find a new delivery option on the Delivery tab in the Mailster settings. Enter the API Key from step 3 and save your settings. More option should be available. Make sure the domain of the email addresses you use as “from” and “reply to” in you campaign are listed here. If not add them via your SparkPost dashboard. If you have multiple licenses of Mailster or use SparkPost with other services you should create a sub account for every website to keep things together. If you use SparPost only for a single Mailster installation you can use the Master account. 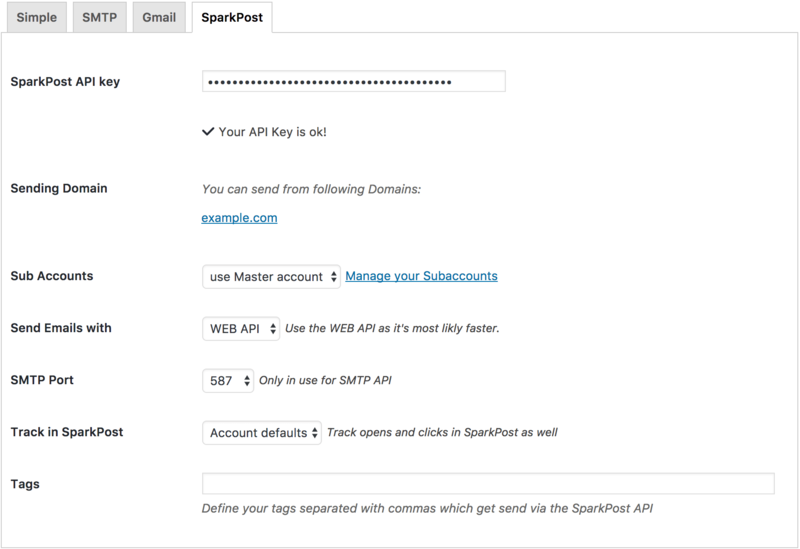 SparkPost has a WEB API and a SMTP API. If possible you should use the WEB API as it’s faster and returns better error messages. If it’s not possible you can go with the SMTP API too. Both offer the same functionality. Define if mails from Mailster should be tracked in SparkPost. This will wrap all links in SparkPost tracking links so you can use the internal stats from SparkPost. You can add a comma separated list of tags you like to attach to each mail which can be found on your SparkPost Dashboard. Now you can go back to Mailster and send a test mail on the settings page. Make sure an email address with the verified domain is used in the from field, the reply-to field as well on the bounce address field.